Sri Lankan President Mahinda Rajapaksa has ordered a probe into death threats to journalists working for an investigative newspaper. The editor and the news editor of the Sunday Leader were sent letters warning them to stop writing against the government or to face death. 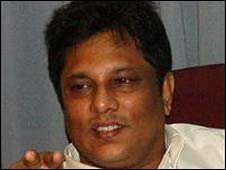 The former editor of the paper - a fierce government critic, Lasantha Wickramatunga - was killed in January. No-one has yet been charged in connection with his death. The latest threats were received after the newspaper carried an update about a controversial video showing a man in Sri Lankan military uniform executing civilians. Following a complaint by the paper's editor to the president, Mr Rajapaksa has ordered "a thorough investigation". Media freedom groups say intimidation and violence make Sri Lanka one of the most difficult countries in the world in which to report.